With the holidays coming and the most popular book for teens in America about a vampire and the most passive female character since Joanie blindly loved Chachi, I’d like to point prospective book buyers in the direction of numerous nonfiction titles that children and teenagers will enjoy. They may not carry the sense of impending doom that young love with the undead can suggest, but they will open any number of intellectual doors. The new DK pop-up Cosmic opens with a bang -- literally. Vividly portraying the “big bang” explosion which created the universe, the first illustration leaps off the page as clear sound effects are heard. Giles Sparrow’s text explains what the big bang was and how the early universe was formed but it is the combination of audio and visual effects (from paper engineer Richard Ferguson) that quickly engages the reader. From the opening spread the book describes space telescopes, the planets (with another startling and this time wider than double-fold 3D illustration), then the sun, other types of galaxies and spacecraft. The information is basic but solid and the overall design makes for a very pleasing introduction for young astronomers. This is a package that does the job it is supposed to -- it explains just enough to whet the intellectual appetite of readers while showing itself off in a way that can not be ignored. If the under-ten child in your life is asking about the moon and stars, then here is an easy way to get them started on a lifetime of stargazing. The best all-round comprehensive astronomy titles for kids that I have seen is Dr. Mark Garlick’s new Atlas of the Universe, part of the Simon and Schuster “Insiders” series of visual guides. Oversized, tremendously illustrated and designed in a direct but far-reaching manner, Garlick conveys a ton of significant information on the universe and our solar system. What really puts this one over the top though is the orderly manner in which it is organized. From a series of pages about the planets and sun (all in two-page spreads that include surface pictures, information about the probes that have reached them and other exploration details) to sections on stars, comets and black holes, the author touches on all the major areas of astronomical interest. There is history about explorers and astronomers, brief mentions of dozens of records (flattest planet in the solar system, most distant galaxy, etc.) and many notable numbers listed, such as the size of the largest known galaxy (6,000,000 light years across). Garlick does a good job of balancing pertinent information with the sort of cool facts that kids enjoy collecting. From a practicality standpoint he also has compiled a series of star charts for the northern and southern hemispheres along with a brief guide on how to use a star map. Altogether this is a supreme package for star gazers; wrap it with a telescope and you will have a fun and educational gift. Ellen Jackson tackles some relatively unknown subjects with her title The Mysterious Universe: Supernovae, Dark Energy and Black Holes. Accompanied by dozens of Nic Bishop’s photographs and illustrations, Mysterious Universe keeps a heavy subject highly readable by focusing on the work of one particular astronomer, Alex Filippenko. Drawn to supernovae as the source for the existence of life (“The carbon in our cells, the oxygen that we breathe, the calcium in our bones -- all were cooked up in the stars and expelled into space by these explosions”), Filippenko is a whirl of intellectual energy and curiosity. He also has a great capacity to inspire, which Jackson conveys in her text. By the second chapter, where she details how he received his first telescope at age fourteen and also blew off an eyebrow and some hair in an after school incident in the chemistry lab, Filippenko is clearly established as the coolest smart guy in the room. He thinks astronomy is an awesome thing and his excitement is contagious. Jackson picks up on that and consequently, Mysterious Universe manages to be a surprisingly exciting book. Because of its narrower focus, Jackson’s book will likely be best received by the twelve and up crowd; they will also appreciate Filippenko’s life story more as it offers a pathway to their own future if they are space-inclined. The Mysterious Universe is a big ideas type of book that is manageable for preteen readers. High school students who are more serious about their futures will also find much of value here as they consider their own paths into the profession. Jackson’s title is another entry in the exceedingly well done Scientists in the Field series from Houghton Mifflin. Generally the titles focus on nature and the environment and there are several others that became recently available which will likely appeal to certain readers. Gorilla Doctors: Saving Endangered Great Apes by Pamela Turner follows the work of specialized veterinarians in Rwanda and Uganda. These “Gorilla Doctors” are intricately involved in the lives of mountain gorillas, one of the world’s most endangered species. Turner specifically writes about one orphaned animal, Fearless, who is raised by dedicated foster parents. Through all the grief and pain in the part of the world where he was born, Fearless is proof of the good work that people can do when they come together. The mountain gorillas are still living a very fragile existence and the work of the Mountain Gorilla Veterinary Project and those who assist them is vital. Turner will likely stir interest in Africa and gorillas through Gorilla Doctors; dedicated animal lovers will eat this up with a spoon. Sneed Collard has two unique books out in the series, The Prairie Builders: Reconstructing America’s Lost Grasslands and Science Warriors: The Battle Against Invasive Species. The prairie book is really unusual; it follows the efforts of a group of scientists who set out to reconstruct a native tallgrass prairie in Iowa. From seeds to butterflies to bison this is an intricate look at climate, geography and nature at its most basic levels. After reading how hard it was to make 8,000 acres the way it used to be, readers will likely never drive down the highway blissfully ignorant of the fields around them ever again. Science Warriors is an easy sell for the CSI obsessed crowd and one of the more dedicated career books for offbeat environmentalists that I’ve come across. By explaining the very real negative impact of multiple invasive species, from the brown tree snake to red imported fire ant to zebra mussels, Collard shows just how badly they can affect an environment. The scientists who work to stop them, using methods as varied as snake-sniffing dogs and ant murderous flies (this will be a favorite for the gross-out crowd) are an eclectic and talented bunch and their myriad of approaches to solving their problems is both surprising and, to no small degree, odd. There are jobs aplenty to consider in Science Warriors; it’s the most unorthodox career manual I’ve found but absolutely gold for a kid who wants to save the world in a an imaginative way. A trio of new biographies were recently released that will appeal hugely to teens with an interest in the more adventurous side of science and nature. Heavily illustrated with period photographs and art they each provide a wealth of historical knowledge in captivating narratives that might compel readers to conduct further research on their own. First up is Norman Finkelstein’s Three Across which revisits the “Great Transatlantic Air Race of 1927” and includes not only the story of Charles Lindbergh and the Spirit of St. Louis but also Richard Byrd and his crew of three aboard the America and Charles Levine and Clarence Chamberlin who crossed the Atlantic on the Columbia. While Lindbergh rightfully earned is place in history, the others have largely been forgotten for their part in the New York to Paris air race. In the opening chapter Finkelstein does an excellent job of describing the highly charged aviation atmosphere that led to the race (and the monetary prize that prompted it) and then moves on to each of the pilots and their aircraft. Levine, the financier, is drawn to the commercial prospects in the route, Lindbergh to the challenge and Byrd, already a highly acclaimed polar explorer, was compelled by scientific discovery and the hope of expanding men’s horizons. While we know what happened to Lindbergh, Finkelstein manages to keep even his story new by showing pictures of his aircraft (he had no forward visibility at all!) and introducing the small factory where the Spirit of St Louis was designed and built. He shows the politics behind Levine’s choice of pilot and the talent Chamberlin exhibited when the two of them flew far beyond their expected destination. Finally it is Byrd and his crew who truly take front and center as the book concludes and their late trip in a far larger and heavier aircraft ends up providing the most data on air travel, just as Byrd had hoped, even though it came at a nearly devastating price. (Remarking on his flight afterwards Byrd said, “I hope no other pilots have that experience. It is not a very pleasant one.”) Tightly written and thrillingly told, Three Across is an introduction to some bonafide American heroes and a reminder of how risky flying used to be. While I would easily agree that 19th century painter George Catlin is worthy of a biography that deserved placement on elementary school library shelves nationwide, I did not expect to be recommending a book about his life to general readers of all ages. But author Susanna Reich more than makes the case for Catlin as the sort of talented, complex and crazily determined American whose life story is not just to be studied but savored. The fact that her book, Painting the Wild Frontier, is illustrated with some of Catlin’s glorious full color paintings as well as dozens of other artworks and photographs just makes it pretty to look at on top of being deeply informative. But mostly I found this book to be a good read because painter George Catlin lived a life that should be studied and he created a body of work that must be appreciated. The theme of capturing the vanishing west, and specifically what Catlin saw as the dying Indian culture, runs through every page in Reich’s book. It is clearly as important to her to explore why Catlin made his artistic choices as it is to detail them. The reader follows Catlin into the west and over to Europe as he pursues his goal to create and display a cohesive gallery of paintings and artifacts that illustrate the American Indian way of life. Fame and fortune are won and lost, and personal tragedies occur as Catlin remains doggedly focused on convincing Congress to buy his collection. Reich’s takes care to point out where there are details lost and holes in Catlin’s biography while still revealing much about the man, his gift and the times he lived in. 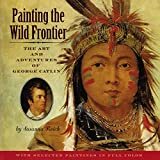 For art minded young readers Painting the Wild Frontier will be extremely helpful; anyone with an interest in America’s frontier history will be drawn into Catlin’s quest and view his paintings as a stunning achievement. While the name Robert Scott might be known to young readers, it is unlikely that they have read about some of the more successful aspects of his fateful 1909 journey to the South Pole. As he explains in the preface to his new book, Emperors of the Ice, author Richard Farr was particularly taken with the “Winter Journey” portion of that expedition. Later recounted by Apsley Cherry-Garrard in his bestselling narrative The Worst Journey in the World, the trip to collect Emperor penguin eggs nearly killed “Cherry,” Dr. Edward Wilson and Lt. Henry Bowers. As it turned out Wilson and Bowers did not survive the race to the Pole with Scott and it was only Cherry who was later able to provide the first person account of Scott’s dedication to science. Unfortunately, Cherry’s book is a bit of a “doorstop” as Farr puts it. A lot of readers might be intimidated by its size (almost 600 pages) or its age. This is most true for teen readers for whom the adventurous aspects of the book would otherwise be very appealing. So Farr wrote about the journey in an easier format. Heavily illustrated with maps and photographs from the expedition, Emperors of the Ice is exactly the sort of book that readers eager for the unknown will adore. Finally, two different cookery books that are each quite appealing in their own way. From DK Books, Grow It Cook It is an excellent gardening title with simple recipes that will be well received by elementary schoolers. Heavily illustrated with color photographs, the pages take readers from planting to cooking in easy steps that should spur active interest in both. I thought it was very clever of the designers to show the plants in containers, keeping the book relevant to both urban and rural children. I also liked how clear the photos are for what the plants should look like, from how the seeds should be sown to the depiction of roots and leaves when the vegetables are ready to be harvested. While Grow It Cook It is the sort of book that will require adult assistance, the children should be able to accomplish much of this work on their own. In the end they will have planted pumpkins and made mini pumpkin pies, planted potatoes and made mashed potato fishcakes; planted carrots and made carrot and orange muffins. This is an introduction to healthy eating from the ground up and a perfect example of 21st century living. Especially written with older kids and teens in mind, The River Cottage Family Cookbook by Hugh Fearnley-Whittingstall and Fizz Carr is a more serious title and at over 400 pages, immensely thorough. This is a cookbook for life, full of recipes and information that will be referenced and used for years. Serious bakers will find much of use but there is everything here from jam to smoothies to spaghetti bologonese, banana bread, mussels a la mariniere and marshmallows -- from scratch. The recipes, while excellent, are almost secondary to the wealth of information on ingredients and the act of cooking. Questions about what flour is, why vegans do not eat dairy and how to grow tomatoes are all answered with long detailed explanations. This is a book that can be read and taught from and stands alone as a unique teaching accessory. (Homeschoolers should be buying this one in droves.) Full of color pictures and even some fun games and projects, The River Cottage Family Cookbook is a title that will grow with readers and likely go with them when they leave home. It’s not a little kid book; it’s a cookbook written with kids in mind. I think a lot of young cooks will enjoy the mature writing style and recipes (although there is plenty of kid-friendly food to be found here), and respond well to the writerly style which expects much from them. If you have a cook who has moved past the basics and shows no signs of slowing down then this cookbook is the one to keep them busy for quite some time to come.